IMPORTANT: Please read this post in full, THEN choose the FIRST answer that applies. How much money have you manifested in the last 18 months? … see it in your mind and you will manifest it into reality. Believe it, and it will be so. I don’t know how The Universe works, so I can’t tell you whether I manifested my millions (perhaps by concentrating on my Life’s Purpose and the Number required to get me there) or was merely driven to make it at all costs … you could certainly mount an argument either way. In that 18 month period, nearly 1,600 participants reported ‘manifesting’ anywhere from $504,873.56 (in just one day; if you choose to believe him) down to just one cent. The average was closer to $3,500 in less than a year, with the median being just $180. I’m not sure what you would count as a worthy ‘manifestation’ amount (I mean, would you dream of anything less than $10k in a year? 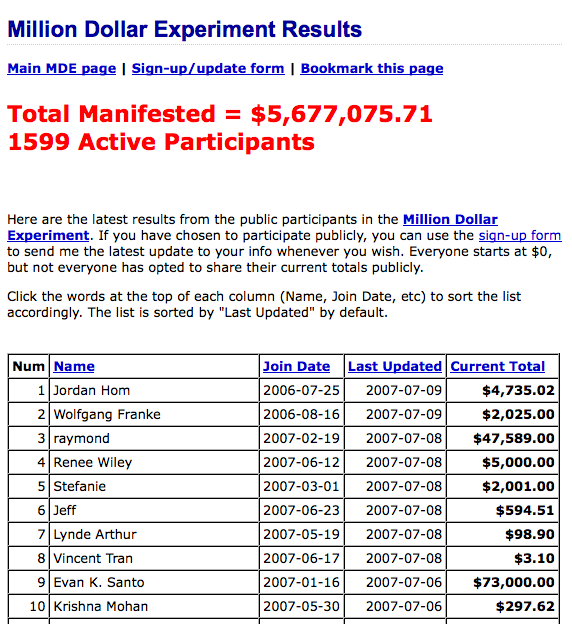 ), but 120 people – just 7.5% of those participating – ‘manifested’ $10k or more in that period. Only count the new money you feel has come into your life as a result of your participation in this experiment (i.e. the manifestation of this intention), not your regular income. Obviously your interpretation of that will be subjective, but this is a subjective experiment. Just do your best, and trust your intuition. Just pretend that you signed up to Steve’s experiment 18 months ago … what money (if any) that came into your life since then would you have reported on Steve’s blog? This entry was posted in money and tagged 7million, 7million7years, millionaire, money, Rich, Starting Out, wealth by Adrian. Bookmark the permalink. Well, I chose less than $10 million by default since by definition that includes all the other choices and sounds a lot more impressive less than $100. I have zero faith in the power of wishful thinking. Sitting on my well padded backside wishing for money to manifest itself will not achieve anything other than wasting time and gaining weight. It sounds a lot like the optimists clubs which sprang up during the Great Depression – they didn’t work either. Much better to focus on the goal and get out there and do something. In any case, I would much rather believe that whatever I have came to me through my own efforts (either with or without an element of luck) than from any other cause. Confusing, I would have put the poll at the end of the post – I responded to the poll before reading the article. “Manifestation” sounds too hokey to me. I’m with Trainee- I don’t believe in wishful thinking. I believe in doing. Two things govern my financial prosperity: prayer and purposeful action. An engineer, a physicist, and a mathematician were on a train heading north, and had just crossed the border into Scotland. The secret, as we know, proposes that your mind is a radio that transmits your thoughts to the universe and that it is somehow manifested. Granted, your mind is very powerful and controls all your actions, and what you get you must have at one time thought or wanted — but this is just a variation of the “black sheep” joke. I thought it and I got it therefore everything I think I will get. … that said! It is probably true that if you want it, you have to think it. Be careful what you wish for, you just might get, you just might get it. I think that’s a song or something. No, seriously, I “manifested” some negative 200 bucks. I must confess, I too am in the same camp. I don’t believe in think it , and you will receive it.I also don’t believe in Ghosts,or life after death or any of that stuff. I am a practical person, who believes you learn,you plan,you work that plan, you receive! On a more serious note the Secret is a well marketed book aimed at the ambitious but lazy. Nothing can be created without thinking about it but action is certainly required. However a call for action is majorly lacking in the secret. Think and Grow Rich by Napoleon hill is a more practical take on the same theory. A theory that is promoted by Andrew Carnegie, Henry Ford, Theodore Roosevelt, Woodrow Wilson, Alexander Graham Bell, John D. Rockefeller and Thomas A. Edison to name a few. “It is not enough that you should have a general desire for wealth to do good with. Everybody has that desire. at random from the dictionary. You would send a coherent sentence, one which meant something. You must know what you want and be specific and definite. You can never get rich or start the creative power into action by sending out unformed longings and vague desires. they do not provide for the reception of the thing they want when it comes. Have you read ‘Think and Grow Rich’? What are your thoughts about it? It is in the public domain so a you can search for a downloadable pdf. @ Derry – I don’t profess to know how ‘stuff’ works; I get a thought, if it makes sense, I act on it, and either get the outcome I was after or not. Who’s to say that the outcome came because I got the thought, or the thought came because the outcome was preordained? i made a bubu….. i answered the poll then read the post. But i answered correctly… guess luck is on my side. I don’t believe in the secret either- actions get you results not wishes. Did people with cancer ask the universe for it? There is a real effect of belief though, if you believe you CAN’T do something- you won’t try and you certainly won’t succeed.